Most stories in the classic pulp fiction magazines published from the 1920s to the mid-1950s were just that – fiction – and were identified and promoted as such. 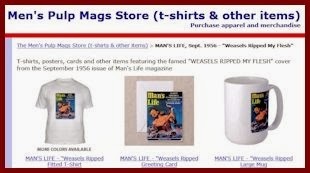 The men’s adventure magazines that flourished from the early 1950s to the mid-1970s also featured pulpy fiction yarns that the editors identified as fiction. But the MAM genre added a new twist. 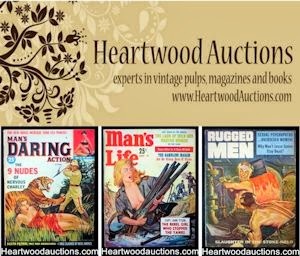 Men’s adventure mags include many stories that are portrayed as true, but which are, in reality, partly or even wholly fictional. Figuring out the fact-to-fiction in MAM stories is often challenging. But I like trying and learn interesting things when I do. For example, there’s a story in KEN FOR MEN, May 1957 that recently led me to do several hours of enjoyable and enlightening research. It’s titled “ISABELLE EBERHARDT: THE LEGION’S MOST WANTED WOMAN” and was written by Bill Wharton. I knew that Wharton had written other men’s adventure magazine stories. But I couldn’t remember how many and what kind. So, I started my research by searching for other stories he wrote. I looked at Wharton’s entry on Galactic Central, the amazing magazine index maintained by my fellow vintage magazine geek Phil Stephensen-Payne. I searched the digitized contents pages I’ve made from issues in my own collection and Googled Wharton’s name. I discovered that he wrote at least several dozen stories for various men’s adventure magazines, some for other types of men’s magazines and some for FATE, the long-running magazine devoted to stories about supernatural and occult topics. I couldn’t find any bios of Wharton. But I did find a good bio of the artist who illustrated Wharton’s story about Isabelle Eberhardt in KEN FOR MEN, Julian Paul, on the official Julian Paul website. Paul was one of the many talented mid-20th Century illustrators who learned his trade at the Art Students League in New York in the 1950s. He went on to work as a professional illustration artist for 40 years. He did artwork for mainstream magazines, men’s magazines and print ads, and cover paintings for paperback books. In the late 1990s, he “retired” to Port St. Lucie, Florida and focused on doing landscape paintings. When I glanced at the two illustrations Paul did for Wharton’s story in KEN FOR MEN, May 1957, I thought it would probably be a fiction yarn. Most of the stories in that issue, including Wharton’s, are listed under that section. The other sections are labeled EXPOSE, OFF-TRAIL and BOOK BONUS. I also noticed that the headings on the contents page of the May 1957 issue don’t even include a “FICTION” section, like many men’s adventure magazines do. 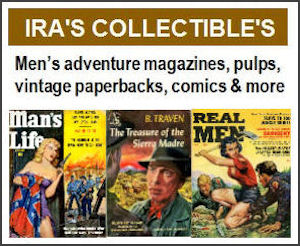 In other words, KEN FOR MEN was one of those men’s adventure mags that billed itself as a primarily fact-based periodical. 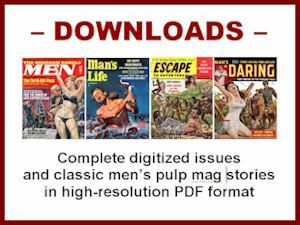 I’m not sure how many readers believed the stories in KEN FOR MEN were true during its sporadic publication from June 1956 to March 1961. I doubt if they worried about it either way. Because the type of stories, artwork and “cheesecake” photos it featured were exactly what MAM readers enjoyed. 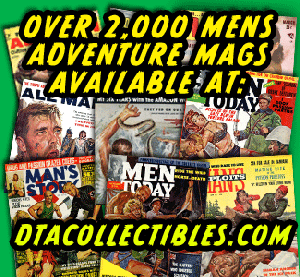 KEN FOR MEN was one of the “Atlas/Diamond” men’s adventure magazines that were published via subsidiaries of the Martin Goodman’s legendary Magazine Management company. The Atlas/Diamond nickname comes from the fact that Atlas was the name of newsstand-distribution company Goodman owned and the magazines in the series were identified by the “Sign of the Diamond” logo, which appeared either on the contents page or some page in the back of each mag. KEN FOR MEN, May 1957 is a classic Atlas/Diamond mag published during what I consider to be the golden age of that series, from the mid-1950s to the late-1960s. The outstanding cover painting is by legendary pulp artist James “Jim” Bentley. It goes with a Western story inside written by Dean Ballenger, an incredibly prolific writer who penned hundreds of men’s magazines stories and scores of paperback novels under various pseudonyms. THE girl raised herself on one elbow and stared with bloodshot eyes across the undulating dunes of the Sahara Desert. The dead camel, in whose shade she sheltered against the fierce noonday beat, stank to high heaven. But she leaned back against it and closed her burning eyes again to the intense blue heat of the sky. Twenty-four hours ago she had slit into the camel's guts to get at its water supply. Even that was finished now as she waited in an almost vain hope that someone would find her. It was towards sunset on her fourth day alone in the desert, after she had been without water for thirty hours, that eight Touareg tribesmen appeared on a sand dune and saw the vultures suspended in the still air over something half a mile away. They turned their camels in that direction and a few minutes later stared down at the unconscious girl. “Si Mahmoud!” one of them shouted and leaped down from his camel with a waterbag in his hands. Gently the men lifted the girl to the back of a camel. They took her to their camp in the shadow of the Riff Mountains. A few days later she was up and around again, singing ribald songs and drinking potent desert liquor with the men who had saved her life. Of all the adventurous women of this century, few can compare with Isabelle Eberhardt, known throughout the Sahara as Si Mahmoud. Just for the heck of it I Googled that name. The search yielded thousands of results. I was amazed and a bit ashamed that I’d never heard of her. But thanks to the story in KEN FOR MEN and what I found on the Internet, I now know quite a bit about Isabelle – and have become a fan. Isabelle Eberhardt was a pioneering, boundary-stretching, cross-dressing female adventurer and journalist who traveled North Africa at the turn of the 20th Century and wrote about its people, Islam and the controversial impacts of French colonialism in Algeria and adjacent areas of the greater Saharan region. And, she was indeed viewed hostilely by most of the French Foreign Legion commanders who were assigned to “pacify” the nomadic tribesmen and other people who lived in that region. After reading the KEN FOR MEN story, I read dozens of online posts about her life, starting with her Wikipedia entry. That led me to watch the movie ISABELLE EBERHARDT, an excellent 1991 biopic available for streaming on Amazon Prime. It stars Mathilda May as Isabelle and Peter O'Toole as the French Army general Hubert Lyautey, who served as a colonial administrator in Algeria and Morocco in the early 1900s. I also found an interesting episode of the TV travel show GREAT JOURNEYS that traced Isabelle’s life and travels. It’s titled THE OBLIVION SEEKER: ISABELLE EBERHARDT. After doing that enjoyable research, I reread Wharton’s KEN FOR MEN story to compare what I’d learned with what he wrote. His story is embellished with several fictional scenes he appears to have created for dramatic effect. They include the opening dead camel gambit, the scene in Isabelle she is tortured by Legionnaires by being dragged behind a horse, and scenes related to the second illustration by Julian Paul, in which she seduces a French Foreign Legion officer and then has him shot and killed. However, many other things in Wharton’s story are either true or quite close to the historical facts about Eberhardt. Isabelle was a well-educated, multilingual, rebellious prodigy who grew up in Switzerland and developed a high interest in Arab culture and writing early in her life. She first traveled to Algeria in 1897, at age 20. Once there, she made friends with local tribesmen and religious leaders, converted to Islam and traveled the desert in traditional desert robes under the name Si Mahmoud. She was even initiated into a branch of the mystical Sufi sect of Islam called the Qadiriyya. Over the next seven years, Eberhardt wrote news stories for a Swiss newspaper owned by a radical French publisher named Victor Barrucand. As Wharton notes in his story, she was one of the world’s first female foreign news correspondents and possibly the first female war correspondent. Her news stories exposing the brutalities and slaughters committed by the French Foreign Legion in their effort to subdue the Saharan tribes earned her the enmity of the many of the Legion’s top brass. Meanwhile, her habit of dressing as a man, drinking heavily, smoking kief (the precursor of hashish) and having casual sexual liaisons with both young Arab men and Legionnaires earned her a scandalous personal reputation. There were also suspicions that she was either a spy for the French or the rebellious Algerian tribes or a double agent for both. Based on that suspicion and her unladylike behavior, French officials deported her several times. But her love of North Africa, adventure and Sufi mysticism kept drawing her back. As noted in Wharton’s story, she ultimately married an Algerian soldier (named Slimane Ehnni) to have more legal protection from deportation. Also as noted by Wharton, a Muslim man tried to assassinate Eberhardt with a sword in 1901. Some accounts suggest he thought she was working for the French or believed she deserved death for flouting Islamic laws. Others say a French commandant hired him to kill her because he suspected she was giving information about Legion activities to rebellious local tribes. Isabelle’s attacker slashed Isabelle’s arm with his sword but failed to kill her. Contrary to Wharton’s version, historical accounts say he was prevented from finishing her off by passersby who restrained him, rather than by her skillful use of the dagger she carried. Eberhardt’s death at age 27 was as unusual as her life. She drowned in a desert town. Wharton describes it vividly and fairly accurately in his story. In 1904, Isabelle was living in a small mud-walled building in the Algerian town Aïn Sefra, located at the edge of the Sahara desert at the foot of the Atlas mountains. On October 21, 1904, a rare thunderstorm swept over the area, something that had not happened for decades. Runoff from the mountains created a flash flood that smashed through Isabelle’s house, drowning her. Her name lives today as it did then, and there is no Arab-man, woman or child-in the Middle East who does not know the story of the white woman who became a leader of the Arab Brotherhood and who drowned in the heart of the Sahara Desert. What Wharton doesn’t say is that Eberhardt’s celebrity status in Europe reached a high point a few years after her death. After the flood, General Lyautey took charge of her burial. He had her laid to rest in the local cemetery and erected a granite tombstone at the head of her grave. Lyautey also found a cache of Isabelle’s unpublished stories and her personal journal in her house. He sent them to Victor Barrucand. Barracund published a set of her stories in 1906 in a book he titled DANS L'OMBRE CHAUDE DE L'ISLAM (later called IN THE SHADOW OF ISLAM in English editions). It was a hit. Two years later he followed that success by publishing Eberhardt’s journal, which also became popular. Interestingly, Bill Wharton’s 1957 story in KEN FOR MEN predates the more recent upsurge of interest in Eberhardt in the US, UK and other English speaking countries. In recent decades, Isabelle’s unique life has been the subject of novels, a play, a dramatic movie, a video biography, TV shows and even an opera. Her own works have remained in print and modern editions continue to published. One of the most popular nowadays is THE OBLIVION SEEKERS, a collection of Eberhardt’s stories and journal notes edited by Paul Bowles, the expatriate author and composer who lived in Tangier, Morocco and was a mentor to many Beat writers. Meanwhile, the number of posts about Isabelle Eberhardt on the Internet has proliferated into the tens of thousands. Given all that, I was a bit surprised that my own first exposure to her was in a men’s adventure magazine story that came out long before she became a modern feminist icon and rebellious cult figure. But, as my revelation shows, you can learn lots of things you didn’t know about by reading old men’s pulp adventure magazines. Some of those things are even true...Sort of. issue in my Payloadz store by clicking this link or the image below.